At the invitation of State Councilor and Foreign Minister Wang Yi, Minister for Foreign Affairs of Laos Saleumxay Kommasith will pay an official visit to China from August 25 to 28. At the invitation of State Councilor and Foreign Minister Wang Yi, Minister for Foreign Affairs of Greece Nikos Kotzias will pay an official visit to China from August 26 to 30. 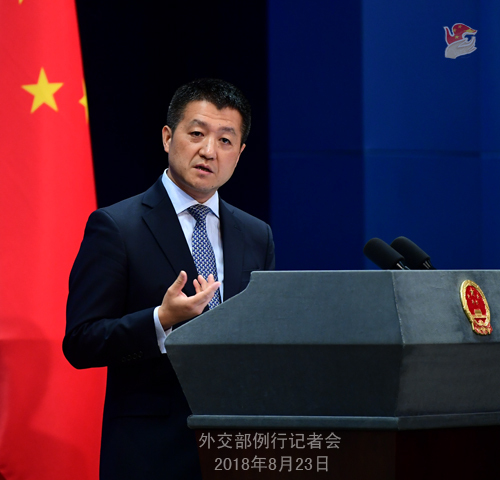 At the invitation of State Councilor and Foreign Minister Wang Yi, Minister for Foreign Affairs of Peru Néstor Francisco Popolizio Bardales will pay an official visit to China from August 26 to 29 during which the 10th Meeting of the China-Peru Diplomatic Political Consultation Mechanism will be held. Q: Both China and the United States have begun enforcing the latest round of tariffs today. This happened at the same time that the Chinese delegation is in Washington for talks. Can you give us any details on how the talks are progressing? Do you think there is any point in the talks considering that the latest round of tariffs has just come into effect today? A: As for the US imposition of tariffs on $16 billion worth of Chinese goods, the Spokesperson for the Commerce Ministry has already made clear China's stern position. In order to safeguard the multilateral trading system and China's legitimate rights and interests, China has already taken necessary countermeasures. 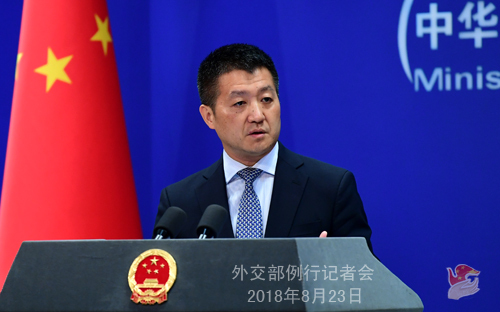 As for the ongoing consultations between China and the US in Washington, we have said many times that we hope the US could meet us halfway, adopt a reasonable and pragmatic attitude, and engage in earnest talks with us to reach a good outcome. Now is not the right time to disclose more about the ongoing consultations. I believe you have also noticed that the spokesperson of the White House also said that these conversations are continuing and they did not give any announcements on them. Q: The Australian government announced this morning to effectively ban Huawei from the building of the 5G network. In the statement this morning, they talked about they did not want companies which might be subject to the influence of foreign governments, particularly ones that have different laws with Australia. Are you concerned about this and is this a blow to Australia-China relations? A: We have noted the relevant statement issued by the Australian government as well as the response from the relevant party. We are gravely concerned about the statement of the Australian side. The Chinese government always encourages Chinese enterprises to carry out economic cooperation with others while abiding by international rules and local laws. The cooperation between the Chinese and Australian enterprises is mutually beneficial in nature. The Australian side should facilitate such cooperation, as this serves the interests of not only the Chinese enterprises but also the Australian companies and consumers. The Australian side should know better than citing all sorts of excuses to erect artificial hurdles and enforce discriminatory measures. We urge the Australian side to abandon its ideological bias and level the playing field for Chinese enterprises' operation in Australia. Q: It is reported that the late Japanese Emperor Hirohito during his final years still found it difficult to reconcile with his responsibility for the war. In 1980, Emperor Hirohito wanted to convey his regret over the war to visiting Chinese Premier Hua Guofeng but dropped the idea because of opposition from other senior officials. What is your comment? A: Our position on that war of aggression against China waged by Japanese militarists is very clear and consistent. We believe that the relevant people in Japan have demonstrated a correct attitude towards that war of aggression, which is a responsible one to have. We have been urging the Japanese government to face squarely and reflect upon its history of aggression, honor its statements and pledges made so far on the historical issue, and properly handle historical issues. Q: The Russian Foreign Ministry said that Russia has invited 12 countries to attend the meeting on the Afghan issue to be held in Moscow on September 4. Will China attend the meeting? Which diplomat will be present? A: Support and participation from the international community, especially from the regional countries, is indispensable for the political settlement of the Afghan issue. The Chinese side supports Russia's positive efforts in promoting peace and reconciliation in Afghanistan. We are in communication with the Russian side on the Moscow meeting. China is willing to make concerted efforts with all parties to help Afghanistan achieve peace, stability and prosperity at an early date. Q: The reporter for the US website BuzzFeed Megha Rajagopalan says that the Chinese government has cancelled her visa, her journalist visa in China. Do you have any information as to why this was the case? 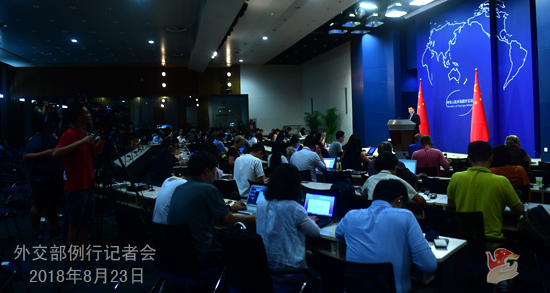 A: The Chinese government handles foreign journalists' visas for China in accordance with laws and regulations. Q: On August 20, the Chinese naval hospital ship Peace Ark concluded its medical assistance mission to four Pacific Island countries-Papua New Guinea, Vanuatu, Fiji and Tonga. Could you talk about this mission in details? A: You are right. On August 20, the Chinese naval hospital ship Peace Ark, which is on Mission Harmony-2018, completed its friendly visits starting from July 11 to Papua New Guinea, Vanuatu, Fiji and Tonga where it provided humanitarian medical service to local people. It is worth mentioning that it was the second time for the ship to visit Papua New Guinea, Vanuatu and Fiji. The visits by Peace Ark were warmly welcomed by the governments and people of these four countries. In order to meet the needs of the local people, Peace Ark provided around-the-clock medical services, running at its full capacity and with great efficiency. According to the information I have at present, during these trips, Peace Ark provided medical consultations and treatments for 6,209 visits in Papua New Guinea, 4,696 in Vanuatu, 6,577 in Fiji, and 5,532 in Tonga. Prime Minister Peter O'Neill of Papua New Guinea, President Tallis Obed Moses and Prime Minister Charlot Salwai of Vanuatu, Prime Minister Voreqe Bainimarama of Fiji, and Prime Minister Samuela Akilisi Pohiva and Princess Royal Sālote Mafileʻo Pilolevu of Tonga all came onboard the ship and praised the selfless assistance from the Chinese government and people. They said that Peace Ark, as a messenger of health and happiness, had further deepened the strong friendship between their countries and China. They all look forward to receiving Peace Ark again. Peace Ark's visits to these Pacific Island countries embody China's diplomatic concept of promoting international humanitarianism and practicing "peace, development, cooperation, and win-win result". China and relevant Pacific Island countries strengthened cooperation in the fields of health and people-to-people exchanges and moved forward friendly relations. China will continue to make its own efforts to promote the well-being of the people in the Pacific Island countries, support their economic and social development, and promote regional peace and prosperity. Q: There have been a lot of speculations that it was because of Megha Rajagopalan's reporting on human rights issues in Xinjiang that her journalist visa was cancelled. Does the Foreign Ministry have any comment on that? A: All these speculations are based on a wrong premise. There is no such question of canceling her journalist visa since in the first place she is not a journalist stationed in China.